The final eight teams in the 2016 Division 3 Playoff bracket look like those you would have predicted a couple weeks ago. The blue bloods like Mount Union and Whitewater are still alive as are some other strong teams. An updated bracket can be found here. Below are predictions for each of the four games in the Quarterfinal round and we will go by quadrant starting with Mary Hardin-Baylor. In the opening round, we correctly predicted 12 of the 16 games while we went 6-2 in the second round with our predictions. Wheaton (IL) opened playoffs with an easy 45-10 win at home against Huntingdon. Their second round matchup was against archrival North Central (IL) on the road and it came down to the fourth quarter. The Thunder were tied at 14 until a field goal in the first minute of the final frame put them up for good 17-14. A soul crushing 70 yard drive resulted in a Sola Olateju 15 yard touchdown run and a 24-14 lead. Olateju added another rushing score as Wheaton won 31-14. Mary Hardin-Baylor opened their playoffs with a 50-28 win over a pesky Redlands team. Their second round opponent was Linfield at home, but the Crusaders were too much on defense. They did not allow an offensive score and held Sam Riddle to 236 yards passing on 26 of 41 and picked him off twice. Blake Jackson accounted for 314 yards of total offense with 2 touchdowns while Markeith Miller had 88 yards and 2 touchdowns on the ground. MHB won 27-10 with Linfield getting their lone touchdown via a 75 yard punt return from Kennedy Johnson. Both defenses are stingy. Wheaton allows 13.8 points per game while MHB allows 14.5. Wheaton allows 56.9 yards rushing, 207.2 yards passing, and 264.1 total yards per game. MHB allows 72.7 yards rushing, 224.8 yards passing, and 297.4 total yards per game. Which offense will get their running game going? Or will it come down to the better passing attack? In a close battle, we like Mary Hardin-Baylor to emerge the victor 17-14. The winner of this game faces Mount Union or Alfred in the Semifinals. Mount Union played at Hobart in the first round and needed 17 points in the final 17 minutes to pull away for the 38-21 win. In the second round they needed a fourth quarter touchdown with Dom Davis hitting Jared Ruth for 30 yards. That gave them a 28-21 lead, which was the eventual final score, but the defense made several stops after the score to preserve the win. Alfred needed overtime to win their opening round game at home against Western New England 30-24. After an interception in the first part of OT, Tyler Johnson’s 2 yard plunge gave them the 6 point victory. Alfred needed two red zone stops (including one on the goal line) to hold on for a 30-24 win at home against Western New England in the second round. It is very strange to say this, but Mount Union will play their third consecutive road game in the playoffs. To be frank, this Mount Union team has not been dominant in either game, but this time of year dominance does not count, only wins do. And the Purple Road Raiders know how to win in December. Against JHU, Mount Union put up 381 yards of offense, which was their third lowest output all season (359 versus John Carroll and 373 at Ohio Northern). In their last four games, the yards per rush has not eclipsed 5.0. The running attack, which has not been bad, will be the key for the offense. The better they do, the better this offense will perform. For Alfred, if one part of the offense is not efficient, the other part will pick up the slack. Against Bridgewater State, the rush offense had 229 yards with just 176 through the air. Against Western New England, it was the opposite story with 287 yards passing and only 121 yards on the ground. The entire offense will need working against their toughest opponent of the season in Mount Union. Alfred allows 97.3 yards per game, but have allowed 100 yards in seven different games. This feels like another Mount Union road victory because they are the better team and have too many weapons on both sides of the ball. Alfred will be hyped for this game, but Mount Union wins 31-17. The winner of this game will play the winner of the Wheaton at Mary Hardin-Baylor game. Wisconsin-Oshkosh opened with an easy 49-13 over Washington University with 410 yards rushing including 204 from Mitch Gerhartz. In the second round, Oshkosh had another good game on the ground with 332 yards and it was Dylan Hecker with 198 yards and 3 scores. The Titans allowed just 56 yards passing and 222 yards of total offense in their 31-14 win over St. John’s (MN). St. Thomas had an easy opening game over Northwestern (MN) 43-0 with 455 yards of offense and a balanced attack. The defense allowed just 162 yards of total offense including 36 on the ground (1.4 yards per carry average). The second round was a breeze as well with a 55-6 crushing of Coe. The offense put up 605 yards with Alex Fenske throwing for 229 and 3 touchdowns, Tucker Trettel rushing for 102 yards and a score, and Josh Parks rushing for 99 yards and 2 touchdowns. Most impressively, St. Thomas held Trevor Heitland to just 43 yards on 24 carries. This game is all about the rushing offense of Oshkosh that averages 282.8 yards per game against the St. Thomas rush defense that allows just 61.9 yards per game. The Titans have a lot of different rushing options with Hecker (967 yards and 15 touchdowns), Devon Linzenmeyer (735 yards and 10 TDs), and Gerhartz (445 yards and 3 TDs). In Oshkosh’s games against their two toughest opponents, Whitewater and Platteville, the Titans were able to get the ground attack going and averaged 5.8 yards per game. St. Thomas has been stout against the run this year, but there was one game in particular where they struggled. That was against Concordia-Moorhead when they allowed 272 yards on the ground and 6.5 yards per carry. The Tommies won barely won that game 23-20 after losing the lead and then getting it back all in the final 30 seconds. This will be a battle in the trenches. Which line can win the battle up front and control the game? We like Oshkosh to have success in this game, with a lot of rushing attempts from both teams, but not much scoring. We will take the Titans to win 16-13. The winner of this game faces the winner between John Carroll and Wisconsin-Whitewater. John Carroll strolled in their opening round win over Olivet 37-12 thanks to 262 yards and 4 touchdowns passing from Anthony Moeglin. The second round was nail-bitter as they had to go to double overtime to win 20-17 over Wesley. Moeglin’s 14 yard pass to Anthony Leonetti gave them the win. The defense held Wesley to 170 yards of total offense and kept Jamar Baynard in check with 62 yards on 19 carries. Wisconsin-Whitewater handled Lakeland in the first round 45-27. They had a balanced offensive attack and put up 485 yards with Josh Ringelberg rushing for 142 yards and 3 scores. In the second round, it was Ringelberg again that led the offense with 146 yards on the ground, but the defense was suffocating giving up just a field goal and a fourth quarter touchdown to win 37-9. The Whitewater offense will come down to the rushing attack of Drew Patterson (1,044 yards and 15 TDs) and Ringelberg (307 yards and 3 touchdowns), who has come on quite nicely in the Playoffs. That duo will be supplemented by quarterback Cole Wilber who has 1,752 yards (56%) and 10 touchdowns (6 picks) this season. The one area that is of concern for Whitewater is the pass defense. We mentioned it last week and it never materialized for Wittenberg as Whitewater allowed only 189 yards through the air and intercepted 3 passes. The Warhawks have allowed an average of 290 yards per game in the air. Can Anthony Moeglin take advantage of the secondary? He will need to play mistake free like he did against Mount Union (18 of 33 for 239 yards and 3 touchdowns), but that has not been the case in the playoffs where he has thrown for 5 interceptions in two games. John Carroll will need to play a complete and mistake free game to beat Whitewater. We are going with Whitewater to win this game 30-21. The winner of this game will play either Wisconsin-Oshkosh or St. Thomas (MN). The four predicted winners of the quarterfinal matchups are Mary Hardin-Baylor, Mount Union, Wisconsin-Oshkosh, and Wisconsin-Whitewater. Check back next week for the predictions for the semifinals of the 2016 Division 3 Football Playoffs. Eight teams remain in the hunt for the 2016 NCAA Division 2 National Championship including all the top seeds in each Super Region. An updated bracket can be found here via the NCAA’s website. After going 10-2 with our first round predictions, we regressed to 5-3 in the second round. Below are the predictions for the each of Quarterfinal games. Shepherd won their opening round game over Assumption 48-31 by building a solid halftime lead of 28-16. They did the same thing in round 2 against LIU Post (26-7 at half), but their offense was unstoppable with 591 yards (375 passing and 216 rushing). Jeff Ziemba threw for all 375 yards with 4 touchdowns and no picks while Brandon Hlavach had 177 yards and 2 touchdowns on the ground. California had a bye in the first round and they even fell behind 17-0 to Indiana (PA) after 7 seconds into the second quarter. That was no problem as they outscored the Hawks 44-6 the rest of the game to win 44-23. Michael Keir threw for 274 yards and 4 touchdowns with no picks to lead the Vulcans. Both teams have potent offenses with California averaging 51.4 points and 458.5 yards per game while Shepherd averages 40.6 points and 480.4 yards per game. Both defenses give up less than 300 yards and 20 points per game. We know that Shepherd’s chances go through quarterback Jeff Ziemba. He has only five interceptions on the season with 68.3% completions and when he is passing the ball well, the offense is very difficult to stop. Consider that Ziemba’s worst game last year was the National Championship against Northwest Missouri State. He played hurt, the Bearcats zoned in on him, and he just could not get much going. He finished 11 of 16 for 136 yards with a touchdown and a pick. In addition, if Brandon Hlavach can have another big rushing game, the offense will probably have 40+ points. California will be led by quarterback Michael Keir. Keir has 2,953 yards (65.6%) with 39 touchdowns and 11 interceptions this year. 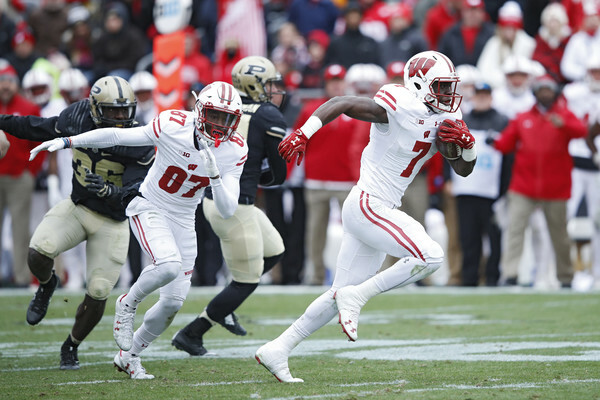 The offense was not overwhelming with 364 total yards, but they did not turn the ball over and converted all six of their red zone attempts against Indiana (PA). This should be a good game and we will go with Shepherd on the strength of Ziemba and the team’s playoff experience. We will take the Rams to win 34-30. North Greenville opened the playoffs with an impressive 27-13 win over Florida Tech on the road. They scored 24 points in the final 30 minutes and forced three interceptions. In round 2, the Crusaders had a 28 point first quarter and cruised to a 45-26 win over Tuskegee. Will Hunter threw for 272 yards with 3 touchdowns (1 pick) and the offense had 239 yards and 3 touchdowns on the ground. North Alabama had a bye in round one and last week took care of UNC Pembroke 41-17 at home. UNA actually trailed 17-10 midway through the second quarter after Pembroke defense recovered a fumble in the end zone for a touchdown. Jacob Tucker had 284 yards with 2 touchdowns and a pick along with 53 yards rushing and two touchdowns to lead the offense while Dre Hall had 9 catches for 135 yards and a score. This is a rematch of the October 22nd game that North Alabama won 52-21. That game was close at halftime with UNA holding a 24-14 lead. Tucker ended up having a field day with 510 yards of total offense and 5 touchdowns. Dre Hall had 10 catches for 162 yards and a score as well. North Alabama has both the better offense and defense. The questions are can Greenville play defense well enough and can the offense score enough points? That is a tough task and we like North Alabama to win this game 45-28. Harding opened the playoffs with a 48-31 over Central Missouri thanks to 355 rushing yards as a team. Park Parish accounted for 291 yards of total offense with 3 touchdowns. They needed overtime in the second round to defeat Sioux Falls 27-24. Harding erased a 10 point deficit in the final 5 minutes. Northwest Missouri State had a bye in the first round and then easily dispatched Emporia State 44-13 in the second round. They held Emporia State to -30 yards rushing and gave up 327 yards through the air. This game will come down to the Bearcats rush defense against Harding’s vaunted rush offense. Harding averages 381.5 yards per game on the ground while Northwest Missouri State allows only 63.9 yards per game. Only once all year have the Bearcats allowed more than 100 yards rushing and that came against Lindenwood. The Bearcats won that game 47-12. It is not hard to envision how this will go. The Bearcats will load up the box to stop the run and it will force Harding to pass the ball. Harding has a grand total of 828 yards passing this year so it could be a disaster of a game if they have to throw a lot. Harding may hit 100 yards on the ground, but that will not be enough. The Harding defense will need to limit the Bearcats on offense and create turnovers resulting in short fields. The Bearcats have just 11 turnovers all season (7 lost fumbles and 4 interceptions). We like Northwest Missouri State to win this contest rather easily. The Bearcats maul Harding 38-7 at home. Ferris State opened the playoffs with a resounding 65-34 win over Midwestern State. Trevor Bermingham had 252 yards of total offense with five rushing touchdowns and there were two defensive interceptions returned for touchdowns as well. Round two was a more pedestrian game in a 38-17 victory. Colorado Mines was still within a touchdown late in the 3rd quarter, but a passing and rushing touchdown from Bermingham (392 yards passing, 44 yards rushing, and five total touchdowns) made it a flattering scoreline in the end. Grand Valley State had a bye the opening round and then blew the doors off Texas A&M-Commerce in the second half to win 55-32 in the second round. The offense had 598 yards with 311 yards passing from Bart Williams (4 touchdowns and 1 pick) and 217 yards rushing by Marty Carter (1 touchdown). Here we have yet another regular season rematch occurring in the playoffs. These two teams met on October 8 at Grand Valley State and the outcome was 35-23 in favor of GVSU. The Lakers took a 28-6 lead into halftime while Ferris State closed the deficit to 28-23 midway through the fourth quarter. A Williams to Nick Dodson 39 yard touchdown pass iced the game. In that game, Ferris State dominated offensively. They had 29 first downs (21 for GVSU), 201 yards rushing (118 for GVSU), and 369 yards passing (232 for GVSU). Ferris State had five turnovers to 3 for the Lakers. It was the missed opportunities for Ferris State that proved to be the difference. Ferris State missed a field goal, had two drives end inside the GVSU red zone (one due to a lost fumble and the other due to a turnover on downs), and had an interception result in a defensive touchdown for Grand Valley State. Reggie Bell was at quarterback for Ferris State that day and he threw for 343 yards with 2 touchdowns, rushed for 140 yards, but also had 2 interceptions and 2 lost fumbles. Bell has been hampered by injuries, which has led to Bermingham taking over. No matter who is playing at quarterback, if Ferris State commits five turnovers again then it may be another bitter loss to their instate rival. This could be a shootout. Yes the defenses are good, but there are playmakers on both offenses. Bell, Bermingham, or even Jahaan Brown (866 rushing yards with 7 touchdown) for Ferris State will be up against Bart Williams (3,024 yards passing with 30 touchdowns and 10 picks) and running back Marty Carter (1,807 yards with 19 touchdowns). We like Ferris State to get revenge and win over their Michigan rivals. The Bulldogs will not turn the ball over as much and the offense will racking up yardage. In a close game, Ferris State wins 45-42. The four predicted winners are Shepherd, North Alabama, Northwest Missouri State, and Ferris State. Check back next week for the semifinal predictions for the 2016 NCAA Division 2 Football Playoffs. The 2016 FCS Playoffs are here. The first round begins with 16 teams playing in 8 games. The winners of those games will then play one of the 8 teams that received a bye in the first round as noted here. The bracket can be found here via the NCAA website. We start off with a replay of a matchup that occurred earlier this year. In that game, Cal Poly put some separation between the schools with two third quarter touchdowns on their way to a 38-16 win. Cal Poly had 354 yards rushing that day, which is par for the course with the Mustangs. Outside of that game, San Diego was pretty dominant with all 9 wins by double digits. Cal Poly lost to FBS Nevada 30-27 in overtime, at #7 seed North Dakota 31-24, #2 seed Eastern Washington 42-21, and against fellow Playoff team Weber State 22-15. That is an impressive resume of losses not to mention wins over South Dakota State (road) and Montana (home). Cal Poly has a lot of options with the rushing attack. It could be Joe Protheroe (1,212 yards and 11 touchdowns), Kori Garcia (834 yards and 6 TDs), quarterback Dano Graves (684 yards and 9 TDs), or Kyle Lewis (587 yards and 6 TDs). If the Mustangs put up 300+ yards on the ground again, this one is probably over. San Diego allows just 82.2 yards per game rushing, but we saw that was not the case in the earlier matchup. If San Diego is going to win this game they will need to do so on the arm of Anthony Lawrence (2,515 yards with 22 touchdowns and 5 picks) as well as the legs of Jonah Hodges (1,222 yards rushing and 15 touchdowns). USD put up only 252 yards of offense against Cal Poly in the first game. We like Cal Poly to win this rematch, but it will be closer than the 22 point spread earlier. San Diego will score points, but the rushing attack for Cal Poly will be too much. The Mustangs win 45-35. The winner of this game gets to travel to #1 North Dakota State for the second round. St. Francis will be traveling in state for this game at Villanova. They won the Northeast Conference and suffered losses all four losses on the road to Montana (41-31), Towson (35-28), Albany (20-9), and Wagner (31-24). Those games were pretty close in terms of score and they faced two Colonial opponents, which is the conference Villanova hails from. Villanova lost at FBS Pittsburgh to start the season 28-7 as well as at Richmond 23-0 and at home to James Madison 20-7. If this is a low scoring game and the Wildcats offense is not moving, they could be in danger of losing. St. Francis puts up 27.5 points and 352.5 yards per game compared to 25.4 points and 373.5 yards per game for Villanova. Defensively, the Red Flash give up 18.8 points and 304.9 yards per game while Villanova allows 14.9 points and 265.1 yards per game. Villanova will try to control the game with the rushing attack. Aaron Forbes (745 yards and 7 TDs), Javon White (482 yards and 7 TDs), and quarterback Zach Bednarczyk (460 yards and 2 TDs) will lead the ground game. Bednarczyk has thrown for 1,684 yards with 15 touchdowns, but also has 9 picks. St. Francis will be led by quarterback Zack Drayer who has 2,357 yards (54.1%) with 21 touchdowns and 10 picks. In all four losses, he has thrown at least 1 interception. The more Marcus Bagley can get on the ground (868 yards and 1 touchdown), the better it is for the Red Flash. This looks like a low scoring game, but one that Villanova should win. We like them to win 24-6. The winner of this game will play on the road at #8 South Dakota State in the second round. Weber State is going across the country for this game in Tennessee. They opened with losses at Utah State (45-6) and South Dakota (52-49 in 2 overtimes). They also had losses at North Dakota (27-19) and at home to Northern Arizona (33-20). They did get a big win over Cal Poly at home 22-15 on November 12. Chattanooga opened 6-0, but hit a rough patch to end the season. They lost at The Citadel 22-14 before back-to-back wins against VMI and Western Carolina. They lost their final two regular season games to Wofford 36-28 and last week to Alabama 31-3. There is no shame in the loss to the Tide especially when they trailed only 14-3 at halftime. Weber State actually gives up more points per game (28.6) than points scored per game (27.1). That certainly will not help them against a veteran playoff team like Chattanooga. Quarterback Jadrian Clark has 2,823 yards (62.3%) with 22 touchdowns and 12 interceptions. He may have to throw for a season high in yardage to keep them int his game (his best is 416 yards against Southern Utah in a 37-36 win). Chattanooga puts up 33.1 points and 404.5 yards per game. They allow 18.2 points and 281.4 yards per game. The Mocs will put forth a balanced offense led by quarterback Alejandro Bennifield (2,173 yards passing with 23 TDs and 7 picks). Derrick Craine (808 yards and 9 TDs) will be the lead back, but Richardre Bagley (543 yards and 5 TDs) will get touches as well. Unless Weber State’s defense has sudden turnaround this game looks like it is all Chattanooga. We like the Mocs to win going away 42-21. The winner of this game will face #5 Sam Houston State on the road in the second round. Lehigh opened with close defeats to Monmouth at home (23-21) and at Villanova (26-21). They responded by winning their final 9 games of the regular season and taking the Patriot League Championship. New Hampshire had losses to San Diego State (31-0), Dartmouth (22-21), James Madison (42-39), and Albany (36-25). Lehigh has an explosive offense that puts up 40.5 points and 491.5 yards per game. The defense is porous at times giving up 23.6 points and 398.1 yards per game. Quarterback Nick Shafinsky has 2,448 yards with 20 touchdowns against 5 interceptions. Running back Dominick Bragalone has 1,106 yards and 13 touchdowns on the ground while Shafinsky has 302 yards and 10 touchdowns rushing. New Hampshire has an offense that puts up 25.9 points and 365.8 yards per game. The defense allows 21.8 points and 358.3 yards per game. The Wildcats have a balanced offense, but do their best when the rushing attack is working well. In their 4 losses, they averaged 108.3 yards per game on the ground compared to 204.9 yards per game in their 7 wins. Dalton Crossan has 1,005 yards with 6 touchdowns rushing on the season. Lehigh’s rush defense allows 191.5 yards per game and that is a number New Hampshire wants to see. This game has a strong possibility of a high scoring game, which may suit Lehigh a bit better. Still, the run game for New Hampshire has a pretty favorable matchup and we will go with the Wildcats to win 49-45. The winner of this game will play at #4 James Madison in the second round. Samford’s losses have come to some good teams for the most part. They lost 41-21 at Chattanooga, 56-41 at Mississippi in a crazy game, and also at The Citadel 37-34 in overtime. Their fourth loss was not a good one at East Tennessee State 15-14, a team that finished seventh in the Southern Conference. Note that all of those losses came on the road. Youngstown State has a similar narrative except for the bad loss. They lost at West Virginia 38-21 as well as #8 South Dakota State (24-10) and #1 North Dakota State (24-3). All of those games came on the road just like Samford. The offenses are opposite in their strength. Samford likes to pass the ball with Devlin Hodges. He has 3,716 yards (71.4%) with 33 touchdowns against 8 interceptions. Look out for Karel Hamilton as the top receiving threat. He has 100 catches for 1,242 yards and 14 touchdowns this season. The rushing attack averages only 103.4 yards per game and is led by K’rondis Larry at 470 yards and 2 touchdowns (5.8 yards per carry). For Youngstown State, they like to run the ball more than they like to pass. They average 260.5 yards rushing and 158 yards passing per game. Martin Ruiz leads the rushing attack with 1,008 yards and 10 touchdowns while Jody Webb had a great final two games. He rushed for 167 yards against Southern Illinois and then followed that up with 166 yards and 2 touchdowns against Missouri State. This game seems to set up a bit better for YSU because opponents have a good time rushing against Samford. They give up an average of 204.4 yards per game on the ground and 419.7 yards of total offense per game. While the Penguins have the better defense (16.5 points and 294.4 yards allowed per game), the Samford offense is potent. Samford has scored a touchdown on 34 of 48 (71%) red zone trips compared to 21 of 43 (49%) for Youngstown State. The YSU defense allows 41% of red zone touchdowns to their opponent and Samford allows 57%. We like Youngstown State’s defense to be the difference here in a close 28-24 contest. The winner of this game will be playing the second round at #3 Jacksonville State. Charleston Southern kicked off the season with a 24-17 loss in overtime at North Dakota State. Two weeks later they lost 52-8 at Florida State, which was not a surprise given they were missing some of their team for that game. Their third loss came at home to Gardner-Webb 17-10 on November 5. Wofford lost 38-13 at Ole Miss in week two before losing two of their first three games in October. They lost 28-26 at home to Samford and then lost on the road at The Citadel 24-21 in overtime. In their penultimate game, they defeated Chattanooga on the road 36-28. Be prepared for a lot of rushing attempts. CSU averages 273.7 yards per game while Wofford averages 295.8 yards per game. Defensively, CSU allows 134.7 yards per game compared to 68.6 for Wofford. When Mike Holloway (860 yards and 9 touchdowns) rushes for more than 100 yards per game, CSU has averaged 41.6 points in those five games. Wofford will rely Lorenzo Long who has rushed for 1,194 yards with 14 touchdowns in 2016. Long has rushed for at least 100 yards in 8 of the last 9 games for Wofford. If this game comes down to the passing attack, then it would be CSU who has the advantage. Shane Bucenell has 1,009 yards with 14 touchdowns and 4 interceptions. However, if CSU has to pass a lot it probably means they are down a few scores. The same goes for Wofford and Brandon Goodson (581 yards passing with 3 touchdowns and 2 picks). We like Wofford’s ground attack to be the better in this game and we will take them to win 24-21 at home. The winner of this game will play at #6 The Citadel in the second round. Of all the games in the opening round, this has to be one of the more intriguing matchups with the MEAC going against the Colonial. The North Carolina A&T Aggies defeated Kent State on the road in week two 39-36 in quadruple overtime. They followed that up with a crushing 58-21 loss at Tulsa the next week. Their only other loss came in the final week of the regular season at North Carolina Central 42-21. The Aggies were down 35-7 after 1:05 elapsed in the fourth quarter. Richmond opened the season with a road victory over Virginia 37-20. Two weeks later they lost 42-14 to Stony Brook on the road. They also lost two of their last three games to James Madison (47-43) and William & Mary (34-13). The Spiders own some good wins this year too: over then ranked #21 Colgate (38-31), then ranked #17 Albany (36-30 in triple OT), and then ranked #11 Villanova (23-0). Both teams have similar stats with strong offenses and mediocre defenses. Obviously, Richmond has played the stronger schedule, but the Aggies are interesting. They average 37.5 points and 418.6 yards per game on offense. They allow 21.6 points and 329.4 yards per game on defense. Tarik Cohen will be the key. He has 1,518 yards with 18 touchdowns and averages 7.6 yards per carry. In their two losses, he had just 98 yards and a touchdown on 27 carries. He had four different games where he rushed for at least 200 yards. What Cohen will be facing is a Richmond defense that allows 23.3 points and 312.5 yards per game. The Spiders allow 155.9 yards per game on the ground. Richmond’s offense will not be led by quarterback Kyle Lauletta after tearing his ACL. He had thrown for 3,022 yards with 24 touchdowns and 8 interceptions. It will be Kevin Johnson who faces an Aggie defense that allows 235 yards passing per game. Receiver Brian Brown has 67 catches for 1,179 yards and 9 touchdowns. Richmond is a big favorite here at home and that is who we are going with to win based on their passing attack. However, we like the Aggies to keep this competitive throughout, but Richmond gets the win 41-31. The winner of this game will play at #7 North Dakota in the second round. Illinois State was an interesting inclusion into this field. They went 6-5, but the strength of their wins and the Missouri Valley helped them get in. They defeated Northwestern 9-7 in week two and then lost the next four games. Two of those losses were to #1 North Dakota State (31-10) and Youngstown State (20-6). 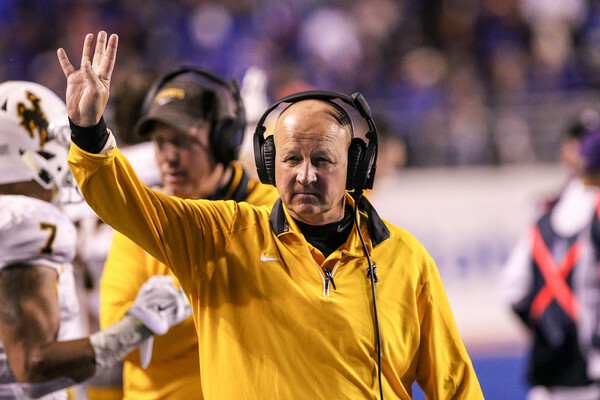 They won four of the last five games including a 38-21 over #8 South Dakota State. Central Arkansas lost to Samford 35-29 n week two, but came back in week four and defeated Arkansas State 28-23 on the road. Their only other loss was the last game of the regular season at Sam Houston State 59-23. Illinois State averages 26.2 points and 390.1 yards per game on offense. Jake Kolbe has thrown for 2,495 yards (63.1%) with 20 touchdowns and 7 interceptions. Anthony Warrum is the big play receiver with 57 catches for 956 yards and 9 touchdowns, but Spencer Schnell (54 catches for 434 yards and 1 TD) and Christian Gibbs (46 catches for 530 yards and 5 TDs) will see quite a few passes thrown their way. Central Arkansas has an offense that puts up 35 points and 448.6 yards per game. Hayden Hildebrand has thrown for 2,668 yards (61.9%) with 17 touchdowns and 8 interceptions. Desmond Smith has 61 catches for 808 yards and 6 touchdowns while Jatavious Wilson has 57 receptions for 784 yards and 3 touchdowns. The rest of the team has 87 catches for 1,109 yards and 8 touchdowns altogether. Both teams have a better rush defense than pass defense and it is Central Arkansas that allows 67.9 yards per game on the ground compared to 132 yards per game for Illinois State. The running combination of Carlos Blackman (580 yards and 4 TDs) and Antwon Wells (492 yards and 8 TDs) for Central Arkansas could have a chance to do some damage on the ground. In another close first round game, we like the home team to prevail with Central Arkansas taking this game 31-28. 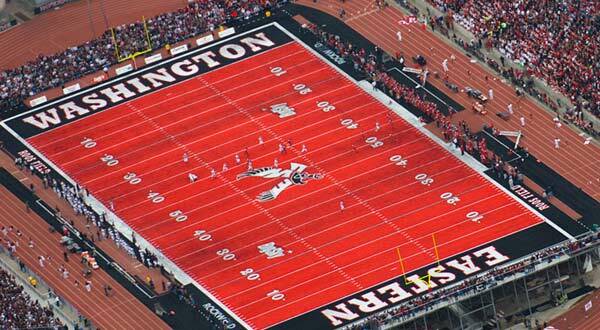 The winner of this contest will play at #2 Eastern Washington in the second round. Here are the predicted winners of the first round in the 2016 FCS Playoffs: Cal Poly, Villanova, Chattanooga, New Hampshire, Youngstown State, Wofford, Richmond, and Central Arkansas. Check back next week for predictions for the second round of the 2016 FCS Playoffs. A wonderful opening round of the Division 3 Football playoff has been completed and the field is down to 16 teams. Those teams will play this weekend in the second round for the right to be in the Quarterfinals. An updated bracket can be found here. Below are predictions for each of the 8 games and we will go by quadrant starting with Mary Hardin-Baylor. In the opening round, we correctly predicted 12 of the 16 games. Linfield went to Texas in the opening round and defeated Hardin-Simmons 24-10. They shut down Hardin-Simmons’ run game allowing only 15 yards. Sam Riddle threw for 367 yards with 1 touchdown with 11 completions to Reed Peterson for 207 yards and 1 touchdown. Linfield now has to go back to Texas for the third time this season. Mary Hardin-Baylor was given fits at home from Redlands, but a strong fourth quarter saw them pull away for a 50-28 win. MHB put up 595 yards of offense, but had three turnovers (one fumble returned for a touchdown) and also gave up a kickoff return to Redlands. The duo of Markeith Miller and Blake Jackson put on a running clinic with 186 yards and 153 yards, respectively. This is also a rematch of a game earlier this season. MHB thrashed Linfield 66-27 with 552 yards of offense including Jackson passing for 217 yards and 3 touchdowns with 1 interception (98 yards rushing as well) and Miller rushing for 165 yards and a touchdown on only 6 carries. The Crusaders had 2 defensive touchdowns and a kickoff return for a touchdown that really crushed Linfield’s hope. This game has a different feel to it than what we saw in September. Mary Hardin-Baylor rushed for 335 yards that day, but after seeing what they did last week to Hardin-Simmons does this seem like the same Linfield team? The Crusaders will certainly get their rushing yards, but how high will that total be? One last thing to consider: Linfield has gone on the road to Mary Hardin-Baylor the last 2 seasons in the playoffs and won both times. Last year it was a 38-35 win and in 2014 they won 31-28. Looks like another thriller this year and we will go with Mary Hardin-Baylor to win 41-38. Another game, another rematch for this region. We will get to that in a second, but let’s start with the first round games. Wheaton handled Huntingdon 45-10 at home thanks to 2 non-offensive touchdowns and a passing touchdown in the span of 4 minutes in the second quarter. Andrew Bowers threw for 204 yards and 2 touchdowns on 10 of 18 passing. Stone Watson rushed for 111 yards and a touchdown on 9 carries. North Central cruised in their opening round game at home 41-7 over Rose-Hulman. Broc Rutter threw for 299 yards and 4 touchdowns with no interceptions on 21 off 33 passing. The defense was stingy giving up 210 yards (103 passing, 107 rushing). Now back to the rematch. In the pivotal game of the CCIW season, North Central defeated Wheaton 35-25 at home. 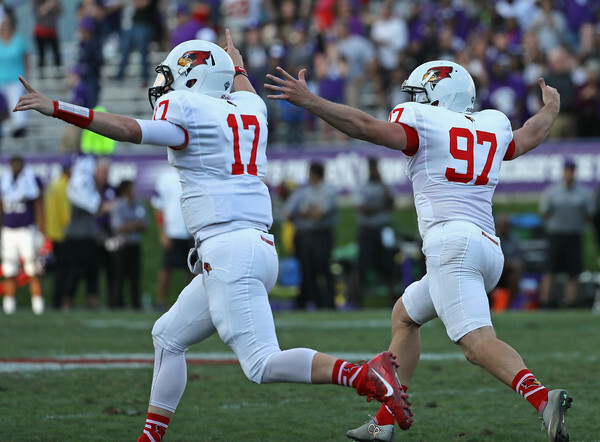 The Cardinals built a 24-5 lead in the third quarter, but withstood a furious rally from Wheaton and to win the CCIW Title. That game was dominated by the passing attacks. Wheaton’s Andrew Bowers went 15 of 31 for 241 yards with a touchdown and an interception. North Central’s Broc Rutter went 23 of 39 for 238 yards with 3 touchdowns and no picks. Wheaton had 108 yards rushing compared to 56 for North Central. This looks like another even matchup between these two rivals. The rush defenses are stellar so it may be another game that is won by the better pass defense and pass offense. In the interest of full disclosure, yours truly is a graduate of North Central and going with them to win 28-21. Western New England had a big fourth quarter to pull away from Husson for a 44-27 victory. They scored 20 points including two rushing touchdowns from Dante Aiken. Alfred needed a 2 yard overtime touchdown run from Tyler Johnson to defeat Bridgewater State 33-27. Both teams will use the rushing attack to get their offense going. WNE averages 248 yards per game (had 211 versus Husson) while Alfred averages 244 yards per game (had 229 versus Bridgewater State). Will it be Nick Connell and Aiken for Western New England or Johnson and Casey Bright for Alfred? We are going with Western New England to take this game 34-31. The unusual sight of Mount Union on the road to start the Playoffs was met with the unusual sight of seeing the Purple Raiders tied late in the third quarter. Mount Union responded with a 17 point burst to win 38-21. Dom Davis threw for 321 yards and a touchdown while Bradley Mitchell (90 yards) and Jawanza Evans-Morris (76 yard) both had 2 rushing touchdowns. Johns Hopkins took a 21 point lead after 15 minutes and went on to win 42-21. Jonathan Germano went wild throwing for 418 yards with 4 touchdowns and 2 picks. Luke McFadden had 11 catches for 222 yards and 2 touchdowns. JHU will want to get that passing attack going and they average 341 yards per game while UMU allows 195 yards per game. The one key will be limiting the interceptions as JHU has thrown 17 of them on the season. If you want to beat a team like Mount Union, you cannot turn the ball over. Both teams also lose fumbles quite often: 8 on the year for JHU and 11 for Mount Union. This does not feel like the same Mount Union team we have seen in year’s past. That is clear from them having to go on the road in the Playoffs. Still, it is hard to go against the Champs and we will take Mount Union to win a high-scoring thriller 45-41. Coe had a very interesting first round game against Monmouth. They won 21-14, but quite frankly it should have not been that close. They forced NINE turnovers. NINE!! Five interceptions and four fumble recoveries and yet they only won by a touchdown. Maybe that is more of a testament to Monmouth and their defense. It is worth noting that Trevor Heitland ran for 251 yards and a touchdown on 50 carries. St. Thomas had a strong performance giving up only 162 yards of offense to Northwestern (MN) in their 43-0 win. The offense put up 455 yards with 206 yards and a touchdown from Alex Fenske along with multiple contributors in the rushing attack. This game comes down to Heitland versus the Tommies defense. They allow 62.5 yards per game on the ground and Heitland could easily top 100 or 150 yards this game based on the volume of his carries. However, the defense will need to produce turnovers like last week to create short field and limit offensive possessions for St. Thomas. That is a tall task here and we will take the Tommies to win 41-17. What an incredible game the Johnnies played in last week against Wisconsin-Platteville. They needed a last second touchdown by Dusty Krueger to win 32-31, but did he get in? Or was he stopped? The refs said he was in and that is all the St. John’s fans care about. Oshkosh was not involved in anything remotely close to that. They just obliterated Washington University 49-13 with 608 yards of offense with 410 coming on the ground. Mitch Gerhartz had 204 yards and a touchdown while quarterback Brett Kasper threw for 192 yards and 3 touchdowns with no picks. Last week, St. John’s survived the Platteville passing attack (held Tom Kelly to 217 yards with 1 touchdown and 1 interception). This week it is the rushing attack of Oshkosh that averages 278.3 yards per game with many different options to lead the attack. The Johnnies defense gives up only 63.1 yards per game on the ground. The Johnnies will try a balance attack against the Oshkosh defense that gives up 265.4 yards per game (95.4 rushing and 170 passing). It is hard to ignore Oshkosh against Playoff teams in 2016 as they are 3-1 with their lone loss to Whitewater 17-14 on the road. The Johnnies will play this game close, but we like Oshkosh to win 28-20. Wesley took care of a stubborn Stevenson team in round one 38-17. Jamar Baynard had 265 yards and 3 touchdowns on 36 carries while the offense put up 540 yards of offense. John Carroll strolled past Olivet 37-12 with 4 touchdown passes from Anthony Moeglin (262 yards and 1 pick). The defense allowed only 188 yards to Olivet including 46 on the ground. This game will come down to Wesley’s offense against John Carroll’s defense. Nick Falkenberg has thrown for 1,456 yards with 15 touchdowns, but also has 8 interceptions this year. Four of those picks came in two of the last four games: Montclair State and Stevenson. Baynard will need to get things going on the ground so the Carroll defense is not teeing off on his quarterback. We like John Carroll to prevail here in a 31-21 win. Their defense will stop the Wesley attack and the offense will be able to move the ball. Wittenberg needed four overtimes to defeat Thomas More 33-30 in what was a battle of field goal kickers in the extra periods. Jake Kennedy had 293 yards of total offense while the defense withstood two 130+ yard rushers to win. Whitewater looked on their way to an easy victory after taking a 28-0 lead, but Lakeland was pesky and did not go quietly. Whitewater won 45-27, but looked mortal at times giving up 366 yards including 339 yards through the air. What is interesting about this game is that Wittenberg can have success against Whitewater’s pass defense. Whitewater allows nearly 300 yards per game through the air, but Wittenberg prefers a more balanced attack (185.3 yards per game rushing and 225.3 yards per game passing). If Wittenberg puts more of a burden on Jake Kennedy’s shoulder, they could make this a good game. We like Whitewater to come out on top here, but if they are getting burned in the pass game and have a lot of turnovers, it will be a lot closer. Whitewater takes this game 48-25. Below are all the teams picked to win by region. Check back next week for the Quarterfinal predictions for the 2016 Division 3 Football playoff. The dust on the opening round of the 2016 Division 2 football playoffs has barely settled, but the second round is already upon us. After 12 games in the opening round, there will be 8 this week with the top four seeds (California (PA), Northwestern Missouri State, North Alabama, and Grand Valley State) will join the fray. An updated bracket for the Division 2 Playoff can be found here. In round 1, we went 10-2 with our incorrect predictions being North Greenville and Emporia State. We hope to go 8-0 with our picks below. Indiana demolished Fairmont State 62-13 in round one thanks to 372 yards rushing and 7 touchdowns from the team. Chris Temple had 20 carries for 147 yards and 4 touchdowns on the ground. California had a bye last week, but had to be keeping an eye on their familiar opponent’s offensive outburst. These two teams met on October 8 where California won 31-28 with last minute field goal. Indiana is averaging 48.4 points per game while California has put up 52.1 points per game. Indiana averages 502.8 yards per game (287 on the ground and 215.8 through the air) compared to 468 yards per game for California (194.4 on the ground and 273.6 passing). The defenses are where this game will be determined. California allows 100 yards less per game at 258.6 than Indiana does at 365.1. Still, if Indiana can get their vaunted ground attack going and control the clock, they will have a very good chance at an upset. California’s rush defense has allowed 81.5 yards per game, but Indiana racked up 235 yards on the ground in their regular season meeting. We feel like this will be another close game as was their meeting back in October. We will take Indiana to pull the upset with their rushing attack 35-31. The winner of this game will face either Shepherd or LIU Post. Shepherd had a strong outing against Assumption and won 48-31 with Jeff Ziemba throwing for 317 yards with 4 touchdowns and 2 interceptions while receiver Billy Brown had 12 catches for 193 yards and 3 touchdowns. LIU Post had to survive a furious Winston-Salem fourth quarter rally to win 48-41. Jeff Kidd threw for 320 yards with 4 touchdowns and 1 interception while David White (134 yards) and Malik Pierre (117 yards and 3 touchdowns) both had good games rushing the ball. This feels like an offensive battle and both teams will score points. Which defense will make the stops necessary to win? Can LIU Post get a big game out of their quarterback and running backs? If they do, that might spell trouble for Shepherd. Jeff Ziemba will need to keep the mistakes to a minimum as that could be the turning point. We will take Shepherd to win this game 49-48 in close battle. The winner of this game will play either Indiana (PA) or California (PA) in the quarterfinals. UNC Pembroke went on the road last week and upset Valdosta State 24-21. It was not easy as quarterback Patrick O’Brien had a horrendous outing with 5 interceptions, but Rontonio Stanle had 122 yards and a touchdown on the ground. The defense forced 4 of their own interceptions as well. North Alabama had a bye and certainly had to like what they saw. UNC Pembroke has an above average offense (34.6 points and 398.4 yards per game) and a mediocre defense (22.2 points and 329.8 yards per game allowed). North Alabama averages 40.4 points and 449.4 yards per game on offense while giving up 14.4 points and 324.6 yards per game on defense. North Alabama’s lone loss came to FCS Jacksonville State, one of the top teams in the 2016 FCS Playoffs. We like North Alabama to win here 34-17. Pembroke does not have enough weapons on both sides of the ball to win especially if the offense has another turnover filled day. The winner of this game will play either Tuskegee or North Greenville. Tuskegee went on the road last week and survived a thriller 35-33 against Newberry. Kevin Lacey had an efficient day going 13 of 17 for 188 yards and 2 touchdowns while Kenny Grant rushed for 139 yards and 1 touchdown. North Greenville had an impressive road win as well defeating Florida Tech 27-13. Will Hunter threw for 247 yards and 2 touchdowns to lead the offense while the defense forced three interceptions. This does not feel like either team will overpower the other. Tuskegee has the better defense giving up 18.4 points and 264.5 yards per game (North Greenville at 24.8 points and 392.4 yards allowed per game), but North Greenville has the better offense at 32.6 points and 417.8 yards per game (Tuskegee at 27.7 points and 353.5 yards allowed per game). Greenville’s Will Hunter does not turn the ball over much (just 3 interceptions this year) while Kevin Lacey of Tuskegee has 6 picks this year. If either team can force a turnover or two, that may be just enough. We will take Tuskegee to win this game 27-24. Emporia State crushed Minnesota-Duluth in their opening round game 59-26. Braxton Marstall had a stellar game throwing for 481 yards with 5 touchdowns and no picks. Two receivers finished with nearly identical stat lines: Louis Dailey had 6 catches for 135 yards and 2 touchdowns while Morris Williams had 4 catches for 134 yards and 2 touchdowns. Northwestern State, the defending National Champions, had a bye last week and they have already defeated Emporia State once this year by a score of 41-14. That game was on the road and this one will be played at home. The Bearcats held Emporia State to 183 yards of total offense, but keep in mind that game was the opening contest for both teams. The Bearcats have not had a close game all year. The closest score was a 28-7 win over Fort Hays State on November 5. The offense averages 49 points and 498.5 yards per game. The defense allows 13.1 points and 246.6 yards per game. The one possible flaw for the Bearcats is that they have lost 7 of their 11 fumbles. Kyle Zimmerman has thrown for 3,056 yards with 34 touchdowns against 2 interceptions in 2016. We like Northwest Missouri State to win the rematch, but in a closer contest. We think the Bearcats take this game 42-28 and they will face the winner of Harding at Sioux Falls in the Quarterfinals. Both teams saw their rushing attack lead them to victory in their first round games. Harding took care of Central Missouri 48-31 thanks to an unstoppable ground game. Park Parish had 118 yards and 2 touchdowns rushing while Eric Simmons finished with 91 yards and 2 touchdowns on the ground. As a team, Harding had 355 yards and 5 touchdowns rushing on 5.8 yards per carry. Sioux Falls won 34-21 over Azusa Pacific after a scoreless first quarter. Max Mickey led the way with 164 yards and 3 touchdowns while Justin Fulks had 90 yards and a touchdown rushing. Sioux Falls had 318 yards and 4 touchdowns on 5.4 yards per carry. To no one’s surprise, this will be a game decided by rushing. Harding averages 385.7 rushing yards per game and allow 68.4 yards per game. Sioux Falls averages 322.8 rushing yards per game and allow 106.8 yards per game on defense. If one offense ends up with a stagnant rushing game, then the passing attack advantage goes to Sioux Falls. They average 205.7 yards per game through the air compared to 63.1 per game for Harding. Max Mickey is up to 1,714 yards rushing and 19 touchdowns while quarterback Luke Papilion has 964 yards and 16 touchdowns for Sioux Falls. Harding’s quarterback Park Parish has 1,028 yards and 19 touchdowns rushing while teammate Michael Latu had 825 yards and 14 touchdowns. We will take Sioux Falls to squeak by at home 28-24. The winner of this game faces either Emporia State or Northwest Missouri State. Texas A&M-Commerce won their opening round game 34-23 over Colorado Mesa at home with solid outings from quarterback Luis Perez (205 yards and 2 touchdowns with no picks) and running back Ovie Urevbu (109 yards rushing). They are rewarded with a trip to Michigan to face Grand Valley State who had a bye for the opening round. Statistically, these teams are similar. Commerce puts up 40.5 points and 450.2 yards per game on offense compared to 39.7 points and 483.4 yards per game for GVSU. On defense, Commerce allows 18.6 points and 392.8 yards per game compared to 17.8 points and 347.4 yards per game for GVSU. The rushing attack advantage goes to Grand Valley State while Commerce has the passing advantage. Luis Perez has 3,007 yards with 29 touchdowns against 3 interceptions. He will need to keep the turnovers down as he has for much of the season to keep Commerce in this game. GVSU will be led by quarterback Bart Williams (2,713 yards with 26 touchdowns and 9 interceptions) and the legs of Marty Carter who has 1,590 yards and 18 touchdowns. With this being a home game for Grand Valley State along with their rushing advantage, we will take them to win 31-24. 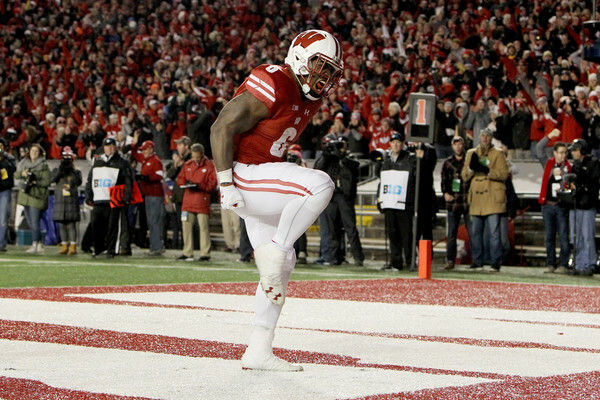 Carter has rushed for at least 100 yards in the last 6 games and we expect that to continue. The winner of this game will face either Colorado Mines or Ferris State. Both schools scored 60+ points in their opening round game. Colorado Mines defeated Southwest Baptist 63-35 after rushing for 405 yards and finishing with 614 total yards of offense. Zac Guy had 23 carries for 214 yards with 4 touchdowns rushing and Sam Seeton had 142 yards and 1 touchdown on the ground. Ferris State won 65-34 over Midwestern State, but they started slowly and trailed 20-10 early in the second quarter. Quarterback Trevor Bermingham had a field day throwing for 126 yards and a touchdown, but did most of the damage on the ground. He had 5 rushing touchdowns along with 126 yards on 26 carries. Colorado Mines puts up a lot of points and yardage with averages of 50 points and 576.8 yards per game. Their defense gives up a some points and yards too at 26.5 points and 414.8 yards per game. Ferris State averages 38.2 points and 494.3 yards per game while giving up 22.4 points and 354 yards per game. We are going to call for a shootout here, which should be no surprise. We will take Ferris State to get it done 56-48. The winner of this game will face either Texas A&M-Commerce or Grand Valley State. Below are all the picks in order of super regional. Check back next week for our Quarterfinals predictions for the 2016 Division 2 Football Playoffs. With teams now known for the 2016 Division 3 Football Playoff, it is time for predictions. A total of 16 games will be played in Round 1 and there are some great storylines to watch in both the opening round as well as throughout the entire Playoffs. A prediction for all 16 games will be provided below and we will go game-by-game in each quadrant. We will start in the upper left quadrant (Mary Hardin-Baylor) and work around the bracket. Redlands will make the trip to Texas for this game and they get a brutal draw. We will not spend much time focusing on this game because Hardin-Baylor will be too much. They have the better offense and better defense. The Crusaders should cruise in this game and we will call for them to win 49-17. The NCAA Committee decided to split the Texas teams (Mary Hardin-Baylor and Hardin-Simmons) and that meant there would be some road trips. Linfield got the short end of the stick in that regard, but this will be one of the marquee matchups this week. The quarterbacks will be the guys to watch in this game. Linfield’s Sam Riddle has thrown for 2,714 yards (66.1%) with 31 touchdowns and 11 interceptions. Hardin-Simmons is led by Ryan Breton who has thrown 2,470 yards (66.8%) with 22 touchdowns and 4 interceptions. It sounds obvious to say the quarterback that makes the fewer amount of mistakes will probably lead their team to victory, but that is especially important in the Playoffs. Both teams have a common opponent this year that is within this region: Mary Hardin-Baylor. Linfield lost 66-27 while Hardin-Simmons lost in a close 20-15 battle. This will probably be a close game and we will go with Linfield to win this 34-31 on the road. Huntingdon will be making the trip from Montgomery, Alabama all the way to Wheaton, Illinois. Huntingdon will bring a balanced offense with them as their passing (284.5 yards per game) and rushing (282.8 yards per game) are nearly identical. The Huntingdon offense will run into the stingy Wheaton defense that only allows 14.2 points per game and 255.1 yards per game. Their rushing defense gives up a paltry 46.5 yards per game and that might spell trouble for the Hawks. We will take Wheaton to win this game at home 31-10 and they will have a chance at revenging their lone loss in 2016 to North Central in the second round. This will be a challenging game for Rose-Hulman because of how complete North Central is. The Cardinals have the better offense and defense while quarterback Broc Rutter has thrown for 2,716 yards (66.8%) with 34 touchdowns against 4 interceptions. We will take North Central to win 45-17 to move on to round 2. Bridgewater State started 0-2 with losses by a combined 5 points. They reeled off 8 straight wins while five of those games were decided by 8 points or less. Alfred started with a 35-28 win over fellow D3 Playoff participant Husson and ended the season with a victory over bubble team St. John Fisher 38-17 to win the Empire 8. Both teams are pretty similar on defense giving up less than 300 yards a game, but the offenses are bit different. Bridgewater State is not as polished in the red zone scoring only 27.4 points per game compared to Alfred’s 37.6 points per game. Alfred’s three-headed rushing monster of quarterback Tyler Johnson (789 yards and 19 touchdowns), Maleke Fuentes (793 yards and 5 touchdowns), and Casey Bright (767 yards and 3 touchdowns) will be tough to stop. We will take Alfred to win this game 38-20. Husson’s lone blemish was to Alfred on the road as mentioned above and since then they have been dominant. Their closest margin of victory in their 9 game win streak was 14 points and their average margin of victory was 28.1 points. Western New England had a really good season as well and they also blew out most of their opponents. Their season finale 36-29 win against Coast Guard was the lone game decided by less than double digits. Husson’s run defense has been incredible this year giving up 28.7 yards per game. Their total defense has been just as incredible giving up 162.2 yards per game, but they will be challenged by Western New England’s offense that averages 251.7 rushing yards per game and 460.5 total yards per game. Western’s Nick Connell has 1,061 yards and 12 touchdowns on the ground so if he can get going, the Golden Bears have a good shot at winning. We are going to go with the road team, Husson, to win 24-17 this game and advance to the second round. Another surprise from the Committee was putting Mount Union on the road to start the Playoffs. Their lone blemish was the shocking season finale loss at home to John Carroll 31-28. Hobart lost 21-17 on the road to RPI on October 8, but bounced back to win their final 4 games. Given how dominant Mount Union has been in the Playoffs it is difficult to pick against them. And we will not be doing that here. The Purple Raiders bounce back from their loss with a crushing 41-13 win over Hobart. Randolph-Macon has the better defense here giving up 11.5 points per game and 281.6 yards per game compared to Johns Hopkins’ 18.5 points per game and 358.8 yards per game allowed. However, the offensive advantage goes to Hopkins with 43.4 points and 521.1 yards per game compared to Macon’s 31.2 points and 402.2 yards per game. Hopkins will be tested by Macon’s top running back Tre Frederick who has rushed for 1,345 yards and 11 touchdowns. Hopkins will want to stop him because that will force Macon to throw the ball and they are not particularly stellar at that. Macon averages just 178.6 yards per game and Joseph Vairo has 1,276 yards (61%) with 10 touchdowns against 8 interceptions on the season. Hopkins will rely on quarterback Jonathan Germano who has thrown for 2,820 yards (65.7%) with 26 touchdowns, but has also thrown 12 interceptions. Germano can run the ball as well with 383 yards and 5 touchdowns rushing, but the top back is Ryan Cary with 904 yards and 14 touchdowns this year. We will take Johns Hopkins to squeeze this win out at home 27-24. The run game and turnover battle will be key here. The downside to winning this game? You are likely to face Mount Union in the second round. Northwestern is making their first ever Division 3 Playoff appearance and they are treated to a road trip to the 2015 National Runners Up, St. Thomas. The good thing for Northwestern is they will not have to face workhorse Jordan Roberts who was so instrumental to the Tommies in 2015. He graduated, but the offense is still potent. The Tommies average 48.3 points and 474.2 yards per game. Alex Fenske will lead the offense while the duo of Tucker Trettel (771 yards rushing and 12 touchdowns) and Josh Parks (673 yards rushing and 9 touchdowns) will lead the ground game. The defense will be tough to score on as well giving up 12 points per game, 213.5 yards per game, and only 65.1 yards rushing per game. For Northwestern, the game will be an uphill battle. They do not have enough offense to get the points needed as they average 324.8 total yards per game. The defense was good this year giving up 11.8 points per game and 325 yards per game, but the Tommies offense is above and beyond anything they have seen this year. We are going with St. Thomas to win this one 56-7 as they look to take their season to the final step and win the National Championship. This looks like a pretty evenly matched game. Both teams can put up points and play some good defense. The offenses have good running backs and quarterbacks who do not turn the ball over a lot. Monmouth will be led by quarterback Tanner Matlick who has thrown for 2,322 yards (73.1%), 27 touchdowns, and only 3 picks this year. Running back DeAndre Wright has gained 1,117 yards and 14 touchdowns on the ground. Monmouth has only turned the ball over 9 times in 2016. Coe has a pretty good duo of their own in quarterback Gavin Glenn (2,244 yards with 64.1% completions, 24 touchdowns, and 4 interceptions) and running back Trevor Heitland (1,619 yards and 13 touchdowns). Hietland is also a threat out of the backfield with 33 catches for 438 yards and 5 touchdowns. In Coe’s three closest games this year (Wartburg, Central, and Dubuque), he had at least 200 yards in each game and finished with 630 yards and 3 touchdowns over those contests. This game may come down to defense and Monmouth holds the advantage here. They have allowed only 8.4 points and 199 yards per game compared to Coe’s 16.9 points and 302 yards per game. This will be a close game and we will take Monmouth on the road 27-24. This is another big first round matchup and the WIAC’s third tournament team is on the road. 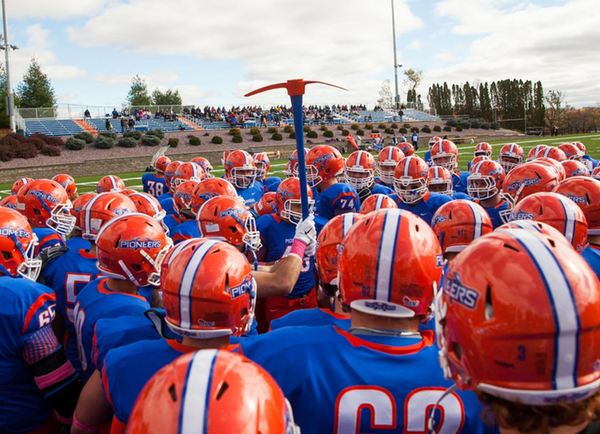 Platteville’s two losses were to Whitewater and Oshkosh by a combined 15 points. St. John’s lost to St. Thomas 33-21 in their only blemish. Platteville will rely on their senior quarterback Tom Kelly who has thrown for 2,727 yards (59.1%) with 36 touchdowns and 4 interceptions. If he is on the same page with receivers Quinn Buschbacher (73 catches for 688 yards and 8 touchdowns) and Dan Arnold (58 catches for 1,108 yards and 15 touchdowns) the Pioneers will be tough to beat. St. John’s will be reliant on their rush game, but there is not one player that will be the main focus. They will use a committee of players to get the run game going, but it is hard to argue with the results: the Johnnies average 231.8 yards per game on the ground. St. John’s would like to stop the run and they have the stronger defense, but they have not faced a passing attack like this. Platteville will give up yards, but this may go down to the last drive. We will take Platteville to win 30-27. Washington had double digit losses to Centre and Case Western at home Reserve during the regular season. Meanwhile, Oshkosh came up a field goal short in their 17-14 loss at Whitewater. The defense for Washington is not particularly good giving up 30.9 points per game and 503.4 yards per game. The rushing game for Oshkosh should have a field day as they average 265.1 yards per game and Washington surrenders 242.6 per game. We are going with Oshkosh to win big 66-10 and easily make the second round. Olivet was obliterated by St. John Fisher on the road 52-10 while John Carroll lost at Oshkosh 33-14 on the road. Both of those games were in the opening week and both teams went on 9 game winning streaks to end the season. John Carroll ended the season with the massive upset of Mount Union on the road 31-28 that set off a chain of events not seen in recent years (Mount Union on the road to start the playoffs and various streaks ended). This game favors John Carroll mainly because they have the better defense giving up 12.4 points and 225.7 yards per game. Olivet has a mediocre defense that gives up 24.7 points per game and 324.7 yards per game. They have a good rush defense at 64.8 yards allowed per game, but remember their game against St. John Fisher. Olivet gave up 281 yards on the ground and 492 yards of total offense. It may be the same thing this week and we will call for John Carroll to win this game 59-13. Stevenson’s lone blemish came at home to Wilkes 38-35 when they surrendered 536 yards of offense and their own offense went 4 of 15 on 3rd down. Wesley had a rough start to the season with losses to Delaware Valley (21-14) and Christopher Newport (42-28) in the first three weeks. They rebounded to win the final seven games and most of those were blowouts. Stevenson does not have an overwhelming offense as they put up 360.7 yards per game, but do score 36.7 points per contest. Dan Williams has 2,146 yards (63.6%) with 24 touchdowns against 7 interceptions. If Devonte Williams (549 yards rushing with 4 touchdowns) is running the ball well, the Mustangs have a good chance in this game. The defense gives up 317.5 yards per game and 17.1 points per game. They will be tested by Wesley’s offense. Nick Falkenberg has taken over the last three games at quarterback for Wesley and the offense has been spurred by it. He has thrown for 863 yards, 11 touchdowns, and 2 interceptions in the last three games. Receivers Bryce Shade (49 catches for 927 yards and 8 touchdowns) and Alex Kemp (46 catches for 770 and 10 touchdowns) will get the bulk of looks from Falkenberg. Jamar Baynard has run for 924 yards with 14 touchdowns and he will need to help the passing game out with some solid rushing yardage. Wesley is favored here and we will take them to win in a close game 28-24. They will do enough on offense (and defense) to pull out the victory and reach the second round. Wittenberg lost to Denison on the road 24-21 midway through the season, but their following four games were impressive as they won every game by 30+ points and had an average margin of victory of 39 points. Thomas More lost their opener at Franklin 43-39, but won the next 9 games. Wittenberg has a bend, but do not break defense giving up 9.6 points per game and 310.6 yards per game. They will be fully stretched by Thomas More’s offense that puts up 517.9 yards per game and 42.8 points per game. Jake Kennedy has thrown for 2,059 yards (60.7%) with 18 touchdowns and 7 interceptions as well as running for 489 yards and 7 touchdowns on the ground, but he will need someone to step up on the offense to help out. It may take a combination effort of Deshawn Sarley (679 yards rushing and 7 touchdowns) and Nick Kendall (494 yards rushing and 3 touchdowns), but Kennedy needs help. Thomas More has a potent offense that will rely on a four man rushing crew: CT Tarrant (1,064 yards and 16 touchdowns), Hjavier Pitts (740 yards and 6 touchdowns), Luke Zajac (481 yards and 6 touchdowns), and quarterback Brenan Kuntz (367 yards and 3 touchdowns). Kuntz can also sling the ball with 2,396 yards (56.9%) with 25 touchdowns and 4 interceptions. Wittenberg’s defense has allowed only 69.6 yards rushing per game this year while Thomas More’s worst rushing performance was a 186 yard effort in the season finale against Thiel. They won that game 63-16 with Kuntz throwing for 345 yards with 3 touchdowns and no picks. We will take Thomas More to win this game thanks to their offense. They will do enough rushing to get past Wittenberg 31-27. Lakeland has faced a UW system school this season in Platteville and it ended terribly as they lost 56-0. Lakeland finished with 160 yards of total offense, threw 3 interceptions, and had 5 fumbles (lost only 1). Whitewater will cruise in this one and the only real question is will Lakeland put up points against a WIAC team in 2016? We think not as the Warhawks will have their way in a 63-0 win.